World Chess Champion Vishy Anand: No Plans to Retire Yet! In an interesting interview to mediapersons on the occasion of a felicitation function in Chennai on Sunday, World Chess Champion Viswanathan Anand has said that he has no plans to retire yet and, in fact, his morale is on a high after beating a "complicated" Boris Gelfand to notch up his fifth world title. "There are definitely no thoughts of retirement. In fact quite the opposite. (Winning a fifth world title) has been a huge boost to my morale. As long as I enjoy, I don't see any reason to retire," Anand told reporters during a felicitation function organised by his long-time sponsors NIIT in Chennai on Sunday. Anand defeated Israeli Boris Gelfand in the World Championship match a few days ago to successfully defend his world title. "I am still enjoying the game having just defended my title. Winning in Moscow meant a lot emotionally. It's not only about records. It's just that you hate losing and you love winning. I am looking forward to playing chess and winning tournaments," Anand said. "For me, the number has been irrelevant. Every title defence is special. I simply want to enjoy playing chess. There is no checklist," he added. Anand also gave a detailed account of his preparations leading up to the match and the turning points during it. "My training was from Jan 15 to April 15. This time my preparation was very intensive because I did not have a camp. Last year I was busy playing tournaments," he said. "We worked very hard and developed some thoughts. I had several systems prepared with black and white. You always had to start with something new. I knew Gelfand since 1989 and always thought he was very professional and disciplined chess player. Someone who had good understanding of the game. He is someone who embodies the best traditions of Soviet Union chess. I knew he would come up with some of the best preparation and he did," he added. Anand said Gelfand was a tough nut to crack and had his own set of innovations. "Boris was a very complicated opponent. He managed to set all his dominant opening aside and come up with entirely new openings. I had to prepare for all the possible things he could do. He prepared very cleverly. We were continuously playing catch-up during the match," Anand recalled. "With the white pieces, he managed to steer clear of our dangerous ideas. This reflected how seriously he was taking the match. It was only in game 11 and 12 that we were able to break out a bit," he said. Anand also explained the turning points of the match. "Most of these big matches come down to one or two turning points. If you don't know how to grab them when they come, that's when the success or failure is decided," he said. "In game seven, we managed to stumble on one area we had not worked as thoroughly as others. It was most difficult moment of the match, I didn't sleep. I was all very disturbed. At that point I could not tell myself that it was the turning point. But in game eight, I had done a lot of work on the main areas but we didn't neglect other areas. I wasn't completely without weapons at that time," he added. Anand said a few changes here and there helped him take Gelfand by surprise. "I don't know whether I caught him by surprise but he reacted aggressively. I was excited about what was to come. I thought I could put him under pressure. The turning point happened very quickly. He made some wrong moves and I was very happy that I could get back into the match. I cannot emphasise how important this moment was," Anand said. "After equalising in the eighth game, I could play the rest of the match in peace," he added. Anand said the second turning point of the match came in the tiebreak. "In the first game, for the first time I could get openings from black pieces. I felt that suddenly the match was opening up. Game two was very back and forth. I prepared strong ideas but he showed what a great defender he was. However, he lacked in the end and he was also short of time." 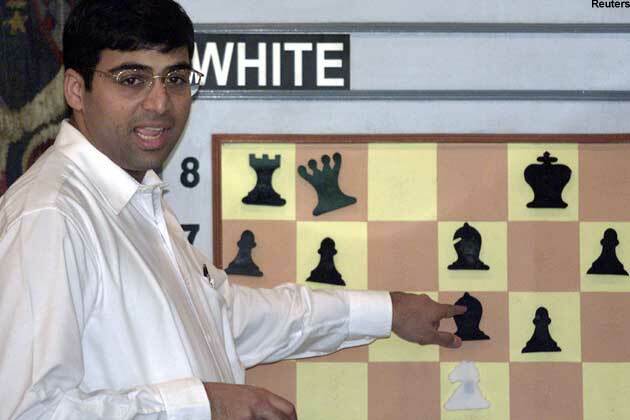 Anand was, however, appreciative of his rival. "We both felt genuine respect for each other. I am really happy to have retained my title. Now I can really relax and enjoy this," he said. Anand also thanked his support team and his wife Aruna for taking the load off him mentally. "The workload in the match is huge, the team helps manage the workload. They allow you to rest and recuperate during the match. My team, the five of us, we have become very close. Very often they would say things are collapsing but you sleep and that gives you a lot of confidence. In the tie-break they gave me confidence. "Aruna and I got married in 1996. She knew nothing about chess when we got married but gradually she has begun to play an important role. She takes a lot of load off me. She knows when to say something and when not to," he laughed. Anand also brushed aside criticism that the introduction of the tie-break system takes the sheen off the World Championships by making it less exciting. "The system is much more fair now. I don't think there should be anyone with any objection to tie-break. I find it fair and a lot of fans really enjoy the tiebreak. I returned home to an absolutely wonderful reception. Would like to thank everyone who took the trouble of coming out," he said.